Bridge 30 was, by the early 1980's, in a totally derelict state. It was only by luck that the arch had not been damaged and it was still possible to cross it on foot. If modern standards of safety had prevailed then, it would probably have been closed to the public. The bridge was surmounted by a six foot cube of concrete - an obstruction commonly created during world war II as a defensive measure supposedly to obstruct the enemy should they invade! The Macclesfield Canal Society decided that full restoration was called for and they set about obtaining the £7000 needed to do the job. A wide variety of grant bodies contributed including the Mersey Basin Campaign and Zeneca, adjacent to whose premises the bridge stands. The block was demolished; a stone gate post was removed and the deck cleared of debris. 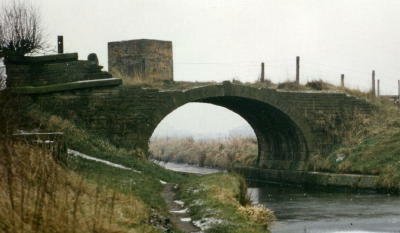 Matching stone and, in particular, coping stones were required and these were collected from a number of locations along the canal including BW's stock yards at Marple and Macclesfield. The parapets were rebuilt as near to the original design as possible using these stones. The deck was concreted over to improve water resistance. A wheel chair ramp was constructed between the bridge level and the canal towing path. The finished bridge was officially opened by the local MP, Nicholas Winterton, on 3rd August 1991. 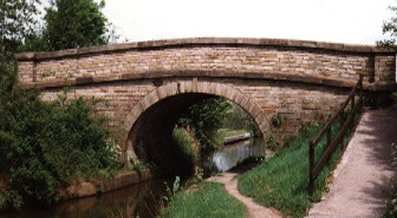 It receives heavy foot traffic - this is the meeting of four well used foot paths as well as the canal towing path and the Middlewood Way passes only 50m away.